Email Extractor is an advanced email addresses harvester. It extracts email addresses from the Internet. You can determine any search criteria; it can be a domain name, a keyword or a searching engine. Email Extractor’s powerful engine will quickly extract email addresses from the websites and top search engines, like Google, Bing and Yahoo. Email Extractor will also automatically remove duplicate emails. With our award-winning extractor, you can easily supplement your mailing list with thousands of email addresses, eliminating the hours of tedious work. 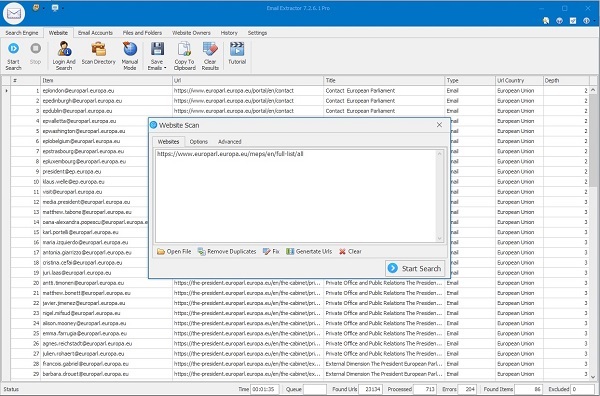 Email Extractor is designed to automatically extract email addresses from the web and your local files, and compile them to a list eliminating duplicate email addresses. The program features a powerful engine, which makes Email Extractor the fastest email harvester. It utilizes the minimum of your computer’s resources and can run smoothly in the background. Why do I need Email Extractor? A powerful Email Extractor is a must-have tool if you are dealing with internet marketing. It is evident that the more people you contact the more potential customers and correspondingly the more sales you’ll have. An email harvester application will help you to double or even triple your contact lists and therefore increase considerably your sales. Just imagine that you can boost your sales up to 30 % with few clicks of your mouse. It is a matter of several minutes. Email Extractor will raise your email marketing campaign to a new level. What Are People Saying About Email Extractor? The easiness of use, user-friendly interface, fast speed and smooth performance make Email Extractor the best harvester application on the Internet market. All of our customers are really satisfied with the features and the superb performance of our email addresses harvester. Email Extractor’s reliability is impressive. The program is easily installed and uninstalled from your PC. Despite of the fact that the program is lightweight and therefore doesn’t take much of your computer resources, its speed is really impressive. It is able to cope with thousands of websites, make a profound in-depth search and retrieve an enormous number of email addresses. Email Extractor will help you to eliminate the hours of tiresome work and spending your precious time in search of contacts. The other important feature of Email Extractor is automatic deletion of duplicate email addresses. The customers may be confident they will receive high-quality support provided by a professional support team. Moreover, after the purchase all our customers will be offered absolutely free upgrades. Before making the purchase, you can download the trial version from our download page to test the program and to see how it works.